Traditionally there are two main kinds of sesame oils in Chinese cooking. These are toasted black sesame oil (黑麻油) and white sesame oil (白麻油或是香油). Sesame oil contains many health benefits and this is why sesame oil is also known as “The Queen of Oils”. In ancient India, sesame oil is a natural antibacterial for common skin pathogens. It’s also a natural anti-inflammatory agent. 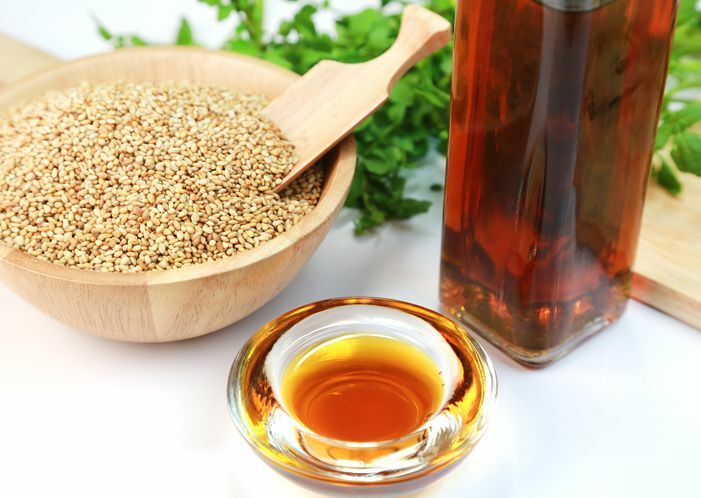 Because of these factors, sesame oil is known in India as “healing oil”. Recent experiments and research have shown sesame oil is also very useful for unblocking arteries and lowering bad cholesterol. It’s also good for your skin and can reduce the risk of colon cancer. But as with most things, be sure to consume it in moderation. Toasted black sesame oil is also known as toasted sesame oil. It is usually deep and dark reddish brown color. Toasted black sesame oil is very strong in flavor so it's not recommended to use toasted black sesame oil as your normal daily cooking oil. To make, toast the black sesame to 70% to 80% cooked then mold the sesame seeds into chunks and press into oil. The flavor and taste is much darker and stronger than white sesame oil. Chinese people usually use toasted black sesame oil for food therapy or food that is supposed to enrich the body. Two famous dishes that use black sesame are sesame oil chicken soup and three cup chicken (sanbeiji). Caution: It’s not recommended for pregnant women to consume toasted black sesame oil as it’s believed it can cause contractions and induce an early labor. The process for white sesame oil is usually to process the white sesame into liquid then boil water and separate out the oil. The color is usually lighter and amber stone or honey in color. The flavor of the white sesame oil is lighter than toasted black sesame oil as well. So white sesame oil is best suited for adding flavor to dishes and inclusion in salad dressings and sauces. There are other kinds of sesame oil products you might find in Chinese or regular supermarkets that are often used for Chinese cooking. Cold press sesame oil differs from black and white sesame oils in that it’s crushed at room temperature in an impeller and not cooked. This cold-press sesame oil has been popular in Taiwan for a few years as people would traditionally cook food with toasted sesame oil. For women who had just given birth, the toasted sesame oil is an extremely “Yang” food in Chinese cuisine and can cause some irritations including high blood pressure, skin rashes, and hot flashes. Cold-press sesame oil, however, doesn’t really cause this kind of body irritation so it’s very popular in Taiwanese food markets nowadays.